The first month of 2017 proved officially to be the warmest ever January on record. The month was also much drier than usual. The first week of February continued much the same with temperatures in the mid- to late teens. The suspected blythi Lesser Whitethroat was seen at Tsim Bei Tsui on the 1st and on 4th. A photograph of the bird has been posted on the HKBWS website at http://www.hkbws.org.hk/BBS/viewthread.php?tid=26088 . A Brown Booby was seen near Sha Chau (waters southwest of Tuen Mun) on 3rd. This is, I believe, the first record since 2010, and is also the first February record. Seven of the previous ten records have been in April/May, with two in August and one in November. A Dusky Thrush was seen at Tsuen Wan (only the second for the winter after one at Chek Lap Kok in November) on 3rd and a male Mandarin Duck was at Tsing Tam reservoir along Shek Kong catchment on 4th. A Red-headed Bunting was reported at San Tin from 4th – 6th, and a Pied Harrier was at the same site on 6th. The Baikal Bush Warbler at Kowloon Bay proved rather elusive but was seen well again from 6th to 8th. The presence of this bird in such a well-frequented urban area has had rather strange consequences. Locals passing by on the way to the local MTR station and the shops have obviously noticed the presence of bird photographers and the Baikal Bush Warbler (along with the Pallas's Grasshopper Warbler) has become something of an avian celebrity. Unfortunately, it seems that some well-meaning locals have started putting out bread for the bird - perhaps following the example of some photographers who they've seen baiting the bird (presumably with insects, not bread). On 7th, John Allcock found and photographed a Great Egret at Shuen Wan that showed features of the nominate race Ardea alba alba (large size, pale tibia). The birds that occur in Hong Kong are of the smaller eastern race modesta. Nominate alba breeds across Europe to the Russian Far East, northeast China (Heilongjiang) and central Japan and is said to winter east to southern China and South Korea. Its regular occurrence in winter in southern China is perhaps debatable as this is the first claim for this taxon from Hong Kong. The Siberian Crane remained on the scrape at Mai Po during the week. On the 9th a replenishment of the northeast monsoon brought cooler weather to the territory with temperatures falling to 9 degrees Celsius on 9th & 10th, the coldest winter day so far. However, the chilly spell didn’t last long and temperatures slowly crept back up, rising to the mid-twenties in the latter half of the week and bringing spring-like sunny days to the territory. There seemed to be more thrushes about during the cold spell. A male Brown-headed thrush was reported from Shing Mun on 10th, and on the 11th, among the more common thrushes, Eyebrowed and White’s were seen on southwest Lantau. The Eastern Water Rail was at Long Valley on 10th. The Siberian Crane remained at Mai Po throughout and the Nordmann’s Greenshank and a Long-billed Dowitcher were present there on 13th. The two Greater White-fronted Geese were seen again at Mai Po on 19th. The Baikal Bush Warbler remained at Kowloon Bay at least until 12th. The first signs of spring migration occurred during this period. Four Whiskered Terns were at San Tin on 12th and an Oriental Pratincole was at Tai Sang Wai on the same day. A Large Hawk Cuckoo was at Lion Rock Country Park on 14th. A Gull-billed Tern and two Black-tailed Gulls were in Deep Bay at Mai Po on 17th. A rare Paddyfield Warbler was trapped at Mai Po on 17th. Finally, a brief note on the Barn Swallow. This species is present in Hong Kong throughout the year but different populations seem to be involved as it is a passage migrant, summer visitor and winter visitor. The first breeding birds usually arrive in towns and villages in mid-February and this year the first returning bird I know of was seen at UK Tau - a village near Sai Kung - on 17th. I expect to see them in my village near Tai Po any day now. The weather was unsettled in the final week of the month. A cold front brought rain and mist from the north and caused temperatures to fall below 10ºC from 24th to 26th; it was 8ºC in the northern New Territories on 25th, which proved to be the coldest day of the 2016/2017 winter. The Siberian Crane and Nordmann’s Greenshank remained at Mai Po throughout and the Baikal Bush Warbler was still in its urban flowerbeds at Kowloon Bay until at least 20th. A male & female Chestnut-bellied Rock Thrush were at Kadoorie Farm on 19th. This is the only regular site for this species in Hong Kong. It is recorded there almost every year, mainly between January and March. A male Chinese Blue Flycatcher was discovered at Shek Kong catchment on 19th and remained until 23rd, although it became far more elusive after 21st. This is the 8th record for Hong Kong but is the 3rd record in the last four years, indicating perhaps that increased observer coverage is leading to this species being detected more frequently than in the past. A female Small Niltava was at the same site on 21st. This rare flycatcher is now recorded annually in ones and twos. Other uncommon birds noted at this site during the same period by local patch-worker John Clough included Bull-headed Shrike, Radde’s Warbler, Grey Bushchat, two Chestnut-flanked White-eyes and 25 Black Bulbuls. A Common Chiffchaff (Siberian race tristis) was trapped at Mai Po on 23rd. This is only the ninth or tenth record for the territory. A female Russet Sparrow was at Long Valley on 25th. This species was only accepted into Category I on the Hong Kong list in 2014 after a review of all previous records by the HKBWS Records Committee. Extreme dates are October 4th to March 28th, with most records coming in autumn from Long Valley. In spite of the bad weather, evidence of spring passage continued. 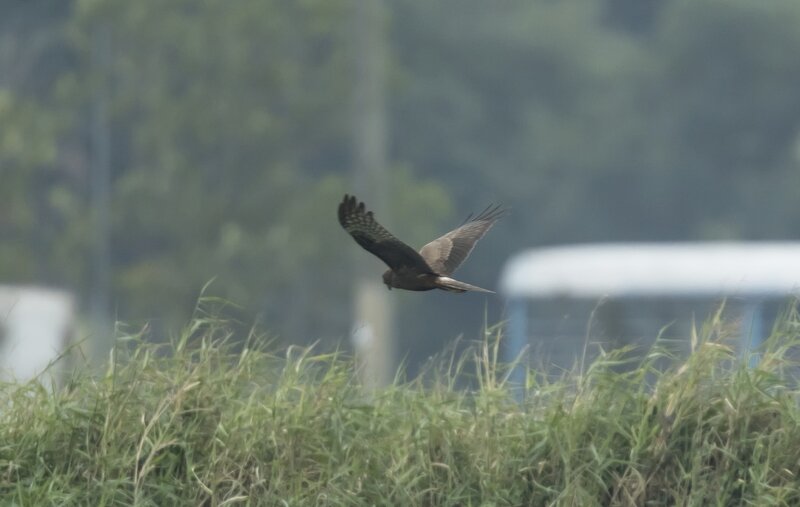 Tai Sang Wai had 13 Oriental Pratincoles and a Eurasian Hobby on 25th. The latter was the first February record of this falcon in Hong Kong, the earliest date prior to this being one on Po Toi on March 19th, 2016. The Chinese Blue Flycatcher was reported again from Shek Kong on 27th. An Oriental Pratincole and a Ruddy-breasted Crake were at Long Valley on the same date.